Rodney McAree and Darren Murphy have spent many Saturday afternoons gracing the same football pitch. But this Saturday will be a very different occasion for the good friends. McAree will be in one dugout with Murphy taking his place in the other and Dungannon Swifts won’t be involved at all! 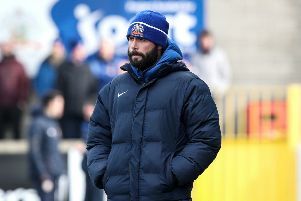 Linfield’s visit to Coleraine Showgrounds will mark McAree’s first game in charge of the Bannsiders since replacing Oran Kearney, and Murphy is relishing doing battle with his old pal. “It’s well documented me and Rodney go back a long way, probably back until we were about eight or nine years old,” said the Linfield coach. “The strangest thing about Saturday will be that he will be in the Coleraine dugout, I’ll be in the Linfield one and Dungannon Swifts won’t be involved in either of our afternoon’s. “I wish Rodney all the best, it’s a great opportunity for him, I know it’s something he has always wanted to do, I just hope he doesn’t get off to a good start! For McAree the opportunity to be involved in big games like this was one of the factors in him taking the Coleraine job. “These are the games that when you get the chance to manage Coleraine, you automatically want to get involved with,” he said. “I’d go and watch big games whenever I got the chance and I’ve always had a burning desire to be involved with them. “The level of professionalism I’ve saw at Coleraine so far is right up there. They are really a club that’s looking to push on and achieve. “I can’t wait to get started now, and there’s no better game than the one on Saturday. “Linfield have been very good so far this season. They recruited well over the summer bringing in the likes of Joel Cooper and Daniel Kearns, so we know it will be a tough test. “It will be good to come up against Murph, we had some great times together at Dungannon. “It wasn’t that long ago the myself and ‘Murph’ were coaches there under Dixie Robinson. “A lot of people might had said Rodney McAree will never leave Dungannon Swifts. “But people that are close to me and know my ambitions would strongly disagree with that. “They always knew if I got the right opportunity I was ready to leave. “It was a hard decision to leave the players, the chairman, the fans, but I’m in the process of completing my Pro Licence, and you don’t go and do that if you don’t want to challenge yourself and go on to bigger and better things. Murphy is also hoping to get some success at Linfield after joining David Healy’s backroom in the summer. “I’m loving life at Linfield. I’ve had a great time here since the gaffer brought me in in July, he’s been brilliant with me,” he said. “I’m loving being out on the training pitch and being around senior players again. “I’ve very fond memories of my time here as a player and hopefully I can replicate that as a coach. “We have a talented squad here and you need competition for places at Linfield and you want people to be hungry to get into the team. “We do have some top class, experienced players on the bench at the minute, as well as the ones who didn’t make the squad. “That’s what the gaffer wants. He wants a team and a squad that is going to be competitive and drive each other on.